Absolutely GORGEOUS!! I love every detail Kristen!! O U T D O N E yourself. All I can say is WOW!! What a warm and inviting fall mantle. Guess what, I just KNOW this will be featured in a magazine, and remember I said that, too! =) I love all the elements. I love the burlap and the big lanterns and the colors. Your floral pieces are AMAZING!! Where do you buy them, if you don't mind me asking? So, so pretty Kristen! I love your use of muted colors. Hello, What a beautiful Mantel, as usual...I am happy to be back blogging and can't wait to see what you have in your shop. I always check you out and I thought of you when I got out the arrangement from you with the two birds for fall. I think we are in the process of "maybe" buying another home, so I am holding off getting anything new. Kristen, as always, this is fabulous! The mantel looks so warm and inviting...the perfect focal point for the room! I've been visiting your Etsy shop to see what I'd like to get this year...I see some new additions on your sidebar! Lol! Everything is just gorgeous! Beautiful, Kristen! I love the warmth and Fall ambiance it exudes! 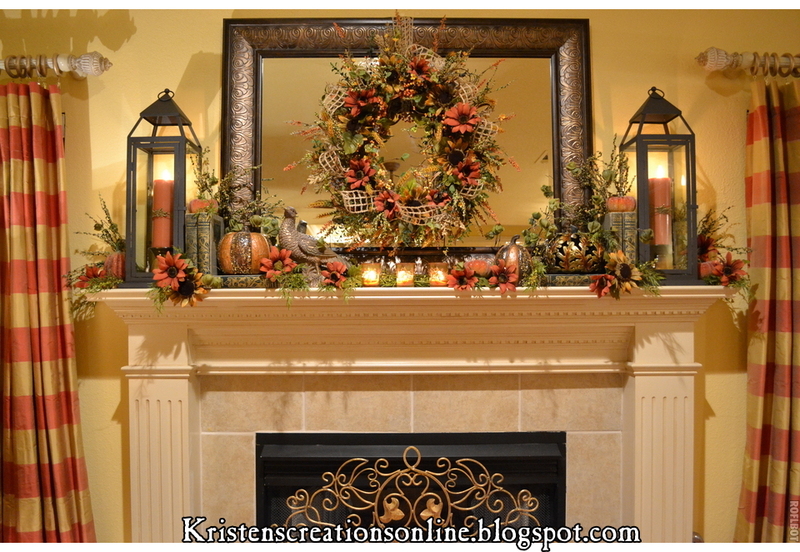 The lanterns are my fave (I have the smaller version of those on my mantel this year ... gotta love Pier One!) Look forward to seeing more! 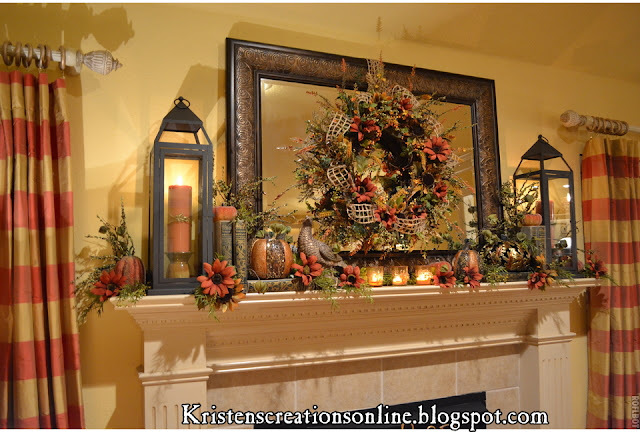 Your Fall mantel looks beautiful, Kristen! Love the wreath on the mirror. Those candles look great inside the lanterns. 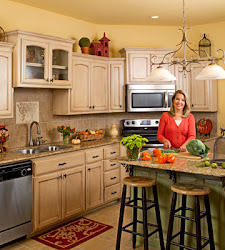 It definitely looks all warm and cozy, and you've certainly provided lots of inspiration with the pieces you used. Pinning it! Oh, Kristen! 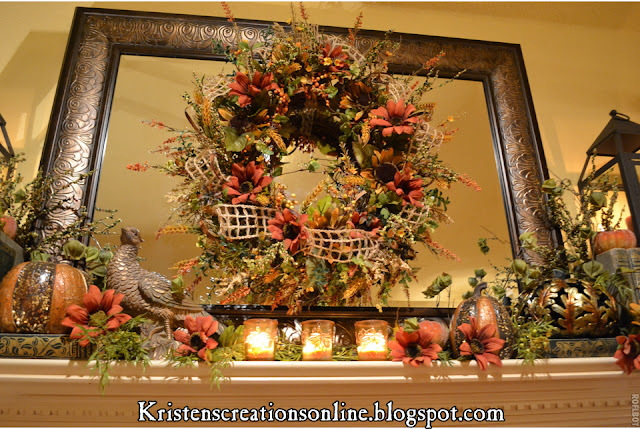 There you go again - your mantel is absolutely gorgeous!! Love everything about it! Very pretty, Kristen. I love it! Of course I always love your work! 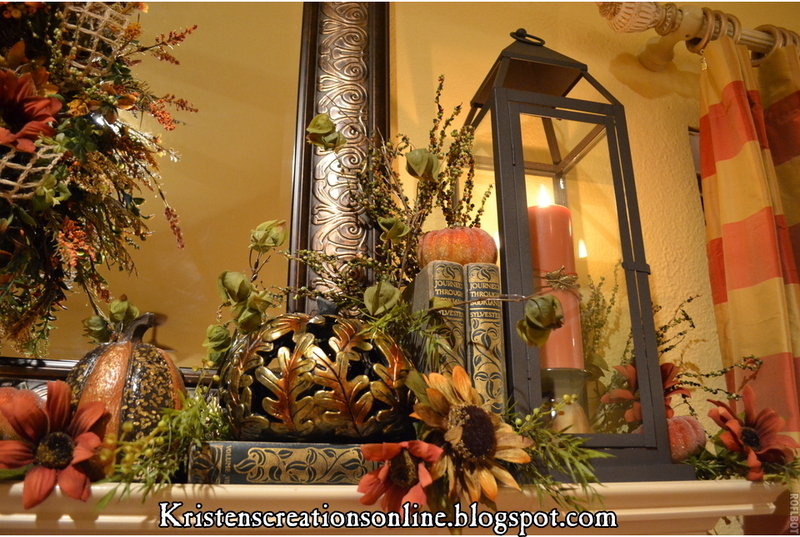 My favorite time of the year is Autumn and the earthy colors are my favorite too. This is just lovely. Wow absolutely gorgeous!! Love it all!! You did an amazing job. I am starting next week! Cant wait!! Just love it Kristen. You always make me want to decorate. As always its gorgeous! I love it Kristen! 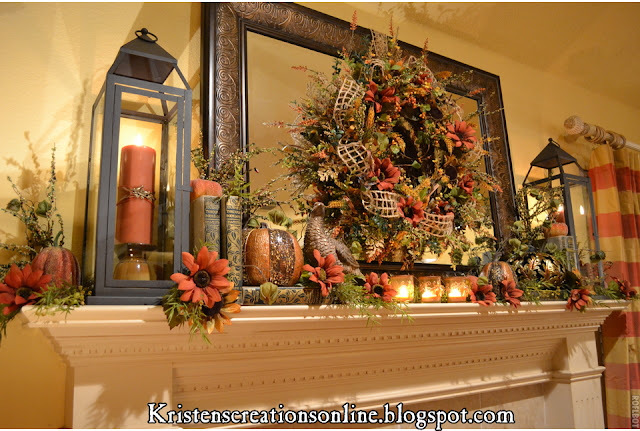 The mantle gives the room a warm cozy feeling. Beautiful! I love the lanterns!! Beautiful!! !...love all of the textures and beautiful accessories...Simply magnificent! It's beautiful, Kristen, what else can I say? I just wish everyone wasn't in such a hurry to shoo summer out of the way. I'm not ready to let go of summer yet! Your site is always such an inspiration. I have no idea if I will "do" an autumnal themed mantle -- this seasonal rotation of stuff is new to me and not necessarily welcome. If I could afford it, I would hire someone like you instead, to come in and do it for me! It is just beautiful, Kristen! You have given me a number of ideas, so I'm going to be copy-catting several things -- hope you don't mind! 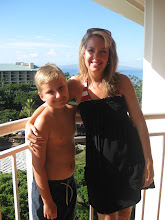 I've just spent some time looking around your blog at past years' post for Fall, & you just have some wonderful things. You are just so creative! So very pretty!!! I love the lanterns & was in my Pier 1 this week, but they only had 1 left. If you ever find another heart crystal I would love to order another frame from you. Or maybe a crystal pumpkin/leaf? Absolutely beautiful. You are one talented lady! I enjoy your blog so much. Speaking of blogs...does anyone know what happened to Kim at Dear Sweet Home? I enjoyed her blog as well, but can't view it anymore? Just wondering. This is absolutely beautiful! I love it! You are a gifted decorator! I love everything about this, I can't even put it into words, I just squeaked and flapped my arms when I saw it (I learned that from my 6 month old nephew). New follower from the Pinterest Party at Debbie Doos. I can't wait to stop back and see more! 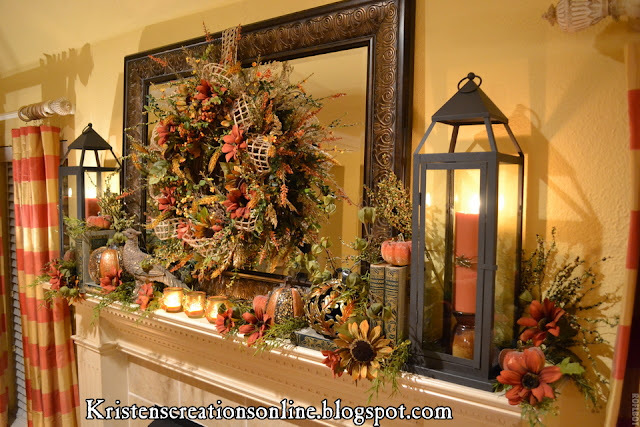 Oh this is a beautiful mantel display! It's so warm and inviting! I love Fall and your mantle captures it perfectly! I can't wait to use some ideas from yours to create mine. Thanks for the inspiration! 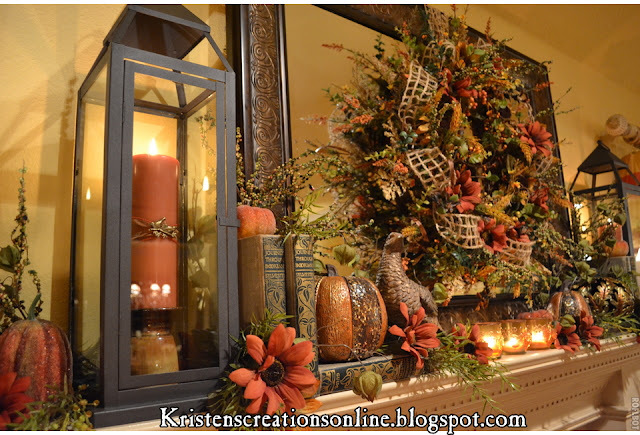 Lovely fall mantel display. 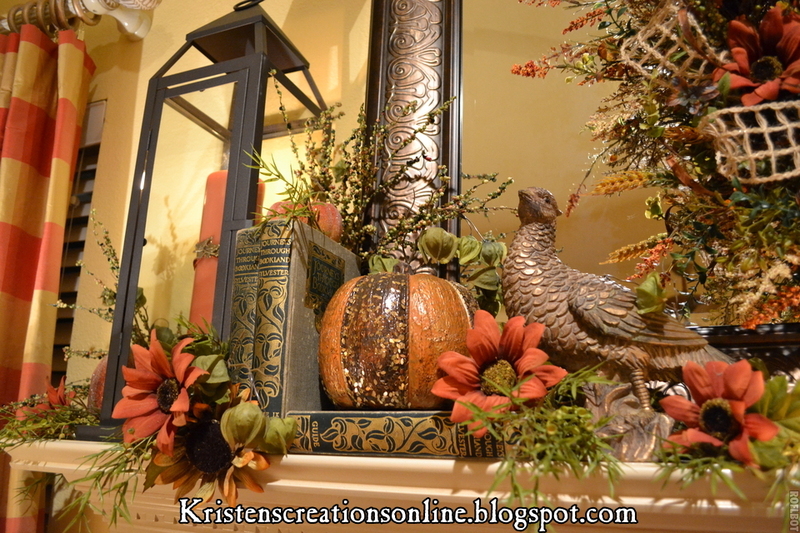 Love the pumpkins and the pheasant. Found you at the Dedicated House linky party. Your mantle is absolutely gorgeous! Every detail is so well though out! Thanks for the inspiration and motivation! This is gorgeous! Found your site thru Dedicated House features. love the color of your walls. i am looking for colors now for my living room. could you share the color? Kristen - this is just gorgeous! You definitely have "the touch". I love the lushness of it all. 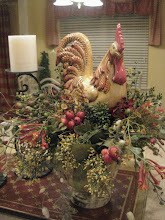 Thank you so much for linking up to The Better Late Than Never Thanksgiving bloghop! 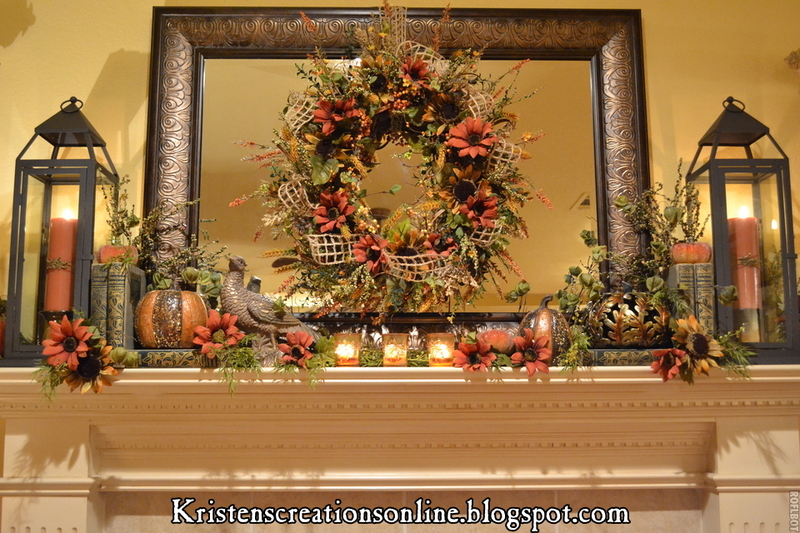 Gorgeous mantel. I especially love the lanterns; thanks for the tip of where to find them. I've been searching how and low for some affordable ones. Thank you so much for sharing and for inspiring me.